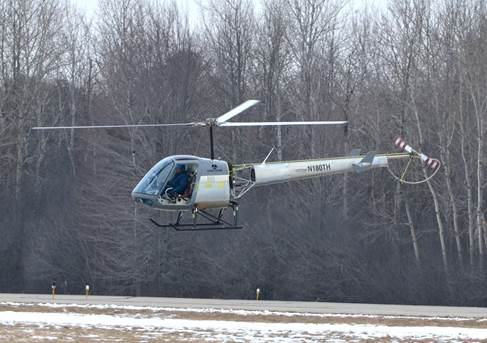 Enstrom Helicopters flew its new two-seat TH180 piston single for the first time on February 6. Following a 30-minute ground run, the helicopter made a 30-minute flight, performing a series of basic maneuvers and maintaining altitudes below 1,000 feet agl. Enstrom will be displaying a flying prototype of its new TH180 two-seat piston-powered helicopter at Heli-Expo next month. The TH180 made its first flight earlier this month and a second ship is under construction and will soon join the flight-test program, according to Orlando Alaniz, the company’s director of sales and marketing. Enstrom also recently received a conforming 210-horsepower HIO-390 engine from Lycoming that will be fitted to a test TH180. Enstrom is targeting the first half of 2016 for certification and delivery, and Alaniz said the company already has received an unspecified number of letters of intent from prospective customers. Enstrom announced the TH180 at Heli-Expo 2014 and displayed a full-size mock-up. The new helicopter is a scaled-down version of the company’s popular FX-280 three-seat model and uses its type certificate and rotor system, moves that should simplify certification. Compared with the FX-280, the TH180 has more robust landing gear and weighs 500 pounds less, about 2,250 pounds maximum gross weight. Company officials said the TH180 should post direct operating costs of $175 per hour and an hourly fuel burn of less than 12 gph. While a price has yet to be set, Alaniz said he is confident that it will be less than $400,000. The TH180 features a GS Engineering engine governor and an electric clutch switch, and the governor can be activated or overridden at the pilot’s discretion. Fuel capacity will be 40 gallons, and the helicopter’s useful load should be around 700 pounds. Alaniz said the company had yet to disclose a final decision on the TH180’s standard avionics package and probably will not develop non-training-related options packages until after the TH180 is certified. However, the TH180 on display does contain elements of the standard avionics package. Enstrom’s expanded and remodeled production plant in Menominee, Mich. has the capacity to build 100 TH180s per year, according to CEO Tracy Biegler. Construction on the new $8 million, 77,000-sq-ft expansion was completed last year. It doubles the company’s space under roof and adds new administration and engineering offices. Concurrently, Enstrom also has been increasing its payroll, adding 90 employees over the last two years. Total employment now stands at more than 250. “We have a nice core group and all the right management in place,” Alaniz said. “We have a new director of operations, a new director of information technology and we are making good progress. We have the right guys in the shop who know how to go out there and make things happen, and we have a new master production plan that allows us to be more efficient.” Enstrom delivered 24 turbine single 480B and 480B-G helicopters in 2014 and two of its legacy piston models. The new 480B-G is equipped with the Garmin G1000H glass panel avionics system. The base price is $1.415 million. The 480B-G was certified in July 2014, and the first customer delivery was made in October 2014. The G1000H system in the 480B features a stacked configuration that mimics the aircraft’s original instrument panel and allows the display screens to be accessible from both pilot positions. Enstrom was purchased by China’s Chongqing Helicopter Investment Co. (CQHIC) in late 2012. That purchase has not only provided the capital for plant expansion and product development, it also has further opened the Chinese market to Enstrom. “China is doing real well for us. We’re averaging sales of about 10 ships a year there, mostly 480s,” Alaniz said, noting that he expects sales there to increase proportionate to airspace deregulation.